Part of the GBC Impact line of professional folders and report covers, this designer two pocket folder is an excellent choice for use in your organization. Each stylish business paper portfolio has two extra large pockets to hold more documents and has a die cut business card holder, brochure holder and CD holder. These two pocket folders are made from premium twill paper that offers a delicate ribbed pattern and can hold up to 60 sheets of paper. Choose from three stylish colors including Burgundy, Dark Blue and Black. 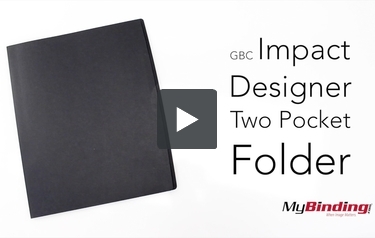 This is GBC Impact Designer Two Pocket Folders! It has has a vertical line texture throughout the cover. There are two pockets to fit 8.5 x 11 inch paper, and the sides extrude a centimeter past the pockets to insure all parts of your pages stay covered. On the left is a spot for a business card. And on the right you can place a Cd, though don’t expect to secure it further with the tabs, as I tried to do here and ruined the cover. You could also put a brochure in this slot. There are three professional colors to choose from, and that is the Impact Designer Two Pocket Folders.